Tonight we were at Walmart picking up a few things and stopped by the pet area. 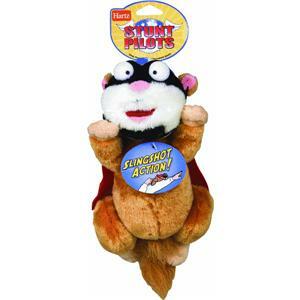 Blitz has this flying squirrel he just loves and we saw some others on sale there. They have a slingshot and you shoot the toy across the room and Blitz runs and gets it. I try to shoot mine and I'm not good at it but it does go over the next aisle. So I tell Rich to shoot it back to me. He disappears to the next aisle and while I'm waiting some people come up to that aisle and are talking to the stock guy from Walmart. You can see where this is going. About this time the squirrel comes flying across the aisle and almost hits the people. I start hysterically laughing, which diffuses the look of anger on the one man's face. Rich comes back laughing, sees the people and was like, "Ruh roh!" Here's a picture of the toys. We got one for Blitz to replace his that has no slingshot and the other two some normal toys.